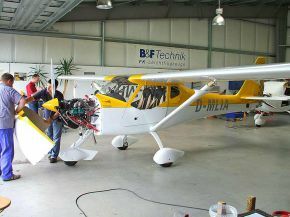 The German company B&F Technik Vertriebs GmbH "FK-Leichtflugzeuge" is active in the field of civil aviation. The main activity is the design, development, certification as well as exclusive after sales support of the motor-driven lightweight FK aircraft series. Production and distribution of the products is license subcontracted to our polish partner company "FK-Lightplanes", from where the aircrafts are delivered to the local FK aircraft sales partners. As the production of sport aircrafts is carried out in relatively small series and the products are therefore nearly 100% hand-made, this division of labor is exemplary for the sport aircraft sector. The FK aircrafts and products are sold in over 23 countries worldwide. The export figures outside Europe for the past three years showed a continuous growth. 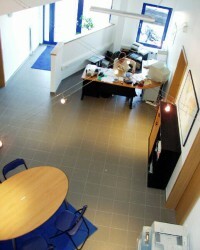 In the B&F FK-Leichtflugzeuge headquarter in Speyer we have the offices for design, administration and customer support. 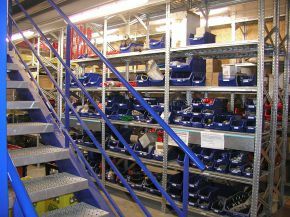 Our warehouse is carrying over 10.000 spare parts on stock to serve customer needs worldwide. 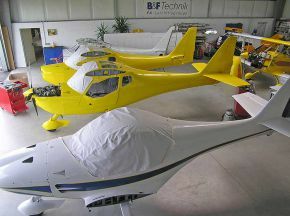 A 700 square meter workshop area is used for assembly, quality control and flight testing. The cooperation with our FK-Nord Service Center in Ottmarsbocholt covers the maintenance for all German customers as well to all surrounding countries. B&F was founded in 1990 by Peter Funk and a student colleague, Dirk Breitkreutz. Headquarter at this time was in Hofheim / Taunus. Both partners were students until 1995, so that in the first three years only small numbers of planes went into production. In 1995 the headquarters were moved to Speyer. Here it was possible to rent rooms in the DASA plant so that the company was located at only a short distance from the airport in Speyer. At first, the Fk 9 plane -developed by Otto und Peter Funk -was produced and sold. In the meantime, this plane has become one of the most popular light aircraft in Europe. Since 1997, another model, the Fk 12, went into serial production and in 1999, the low wing Fk14 was added. Since that FK has became one of the most important players in the German and European Light aircraft market. Continuous update and innovative product developments are keeping the FK products in the top ranking of Europe's light aircraft registration statistics for more than 20 years now.